Now, where's that lottery kiosk? I feel like a lucky man today. Oh I know, I am a lucky man, I have a great wife, two great kids, health and on and on. But I'm talking about throw the dice kind of luck. Two examples. Number one. I was on the Mitre saw, working on a bench for the front entrance. Now I've often talked about safety, about awareness, of knowing where your fingers are, but this isn't one of those stories. I had just finished cutting a piece for the bench, stopped the saw, lifted it, reached for a small end cut off the piece, so I could continue cutting. The still spinning saw touched my index finger, scraping, oh about one layer of skin off, not even drawing blood. All in all, a pretty cheap lesson in awareness. Number two. Yesterday two of the guys put the 5/16th plywood underlay in our hallway and living room. The underlay is a smooth layer of plywood that goes over the subfloor, it creates a good surface for the flooring. 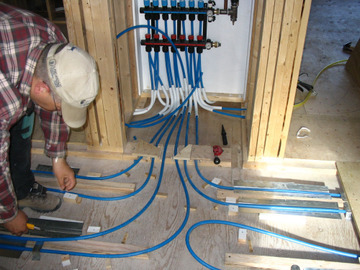 It goes over top of the subfloor, which in this case, goes over all of our heating pipes. Now the underlay is glued, and attached with staples over much of the surface, and inch and 5/8 ring nails where there are joists. At coffee one of the guys asked about what the layout of the joists and pipes in one of the closets of the master bedroom, so he could avoid nailing where there were pipes. As I walked down the hallway I looked at what they did yesterday. There is a manifold in the laundry chute that serves our living space. Pipes come out of it and go up and down the hallway, the joists between the subfloors are not continuous, and the pipes cross the line the joists would follow. You'll notice in this photo that pipe cross the joists six times, but what I noticed when I looked at the floor was two continuous lines of nails, spaced two to three inches apart running right through where those pipes are. Putting a nail into one of those pipes would mean ripping up a floor, and if we couldn't fix it some how, ripping up the entire floor and starting over. I don't know how, and I doubt it could be duplicated but they missed those pipes, each and every one. Time for that lottery ticket. "Oh. By the way, the RCMP is going to be picking me up later this afternoon." I didn't always dislike surprises. In fact, not that long ago I rather enjoyed them. Then I started building a house, and surprises, well lets just say I much prefer life without surprise now. I actually, rather foolishly I might add, thought that we were done with surprises at this stage in the game. I mean we're almost done, what possible land mines could await us. I thought that when the plumber left there wouldn't be anything left to jump out from behind a corner. And there were a couple of doozies when the plumber was here. One day I walked in the back door with Gary and Dale (the mechanical guy) waiting there, saying "we need to talk". The first of their two surprises was about the water pump. The water pump (the pump that gets the water from our water tanks to, well pretty much everywhere in the house) that was spec'd for the house by the engineers is for a city water system, one where there is already pressure in the lines. It would not work on a tank system. After a flurry of emails and phone calls we were able to 1) find a suitable pump that would meet the same specs (basically), do the job, and available; 2) persuade the engineers to bear the costs, and; 3) get a pump on the next plane up. Their second surprise turned out to be a non-starter, but was good enough to drop me to the floor for a bit. They said we had no burner for the boiler. Gary and my conversation went something like this "There is no burner for the boiler." "No." "Yes." "No." "I'm afraid so." "Noooooo." (It was morning, what can I say I'm a slow starter.) But the advantage of having crawled through all of our crates and boxes a thousand times is that occassionally you remember things. And I remembered a burner. Turned out it was pretty easy to find. So basically it was just a case of the person that was supposed to bring in everything the plumber needed didn't. I intend to rip a strip off of myself at a later date. There were several other surprises that involved the mechanical systems, but I expected that. And I expected that that would pretty much be the end of them. Then came this week. It started when we started moving the flooring in. The flooring in most of the house, except the bedrooms, bathrooms and kitchen, is a product called iCore. It is a plastic floating flooring, commercial grade, that looks like a hardwood floor (in our case Australian Laural). With the flooring comes the instructions, and the revelation that we need about 400 oz of a Coreweld glue to install the floor. Hmm, guess they didn't think we needed that. Then came surprise number two. We have an attic, and the entrance to it is from the hallway right above the stairs. We have a folding ladder attic door to facilitate getting into the attic which is quite spacious and earmarked for storage. So this week we got the attic ladder to install. Okay, maybe I'm just picky. But I kind of wanted a door that sits in a prominent place in our house to, I'd don't know, look good. You know something I wouldn't be embarassed to have in my garage. The attic ladder is definitly the latter. Let's ignore the fact that the quality of the ladder itself is poor, it is not square (or close) and looks like it was put together first thing Monday morning. The part of the ladder that covers the hole in the ceiling is a piece of 1/4 inch plywood, the type that some of our crates were made out of. 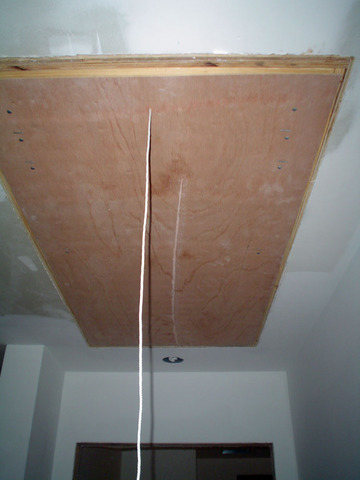 A large crack that has been patched runs most of the length of the panel, staples and rivets prominently hold it in place, a string is used to pull it down, instead of a recessed cup and hook system. So a large part of my week was coming up with a new panel for it, so it will not look out of place on the ceiling. Eventually what has been done is this. Molding is put on to frame the ladder panel. A sheet of mdo (a paper covered smooth plywood) will cover the original plywood. This will all eventually be painted white and should look quite nice. At least a lot nicer than what was in the box. It started out to be a pretty good day, and if the truth be told ended on a high note. But there was a stretch in the middle that bit, big time. The morning found me doing little things around the house, building a stand for a glycol pump for instance, and then I headed home for a phone meeting which turned out surprisingly well, and relieved some of the pressures we've been feeling lately. The afternoon found me back at the House helping in the preparations for getting heat in it. We were filling the boiler and the system with glycol, and I suppose some explanation of the set up is in order. The glycol is mixed with water and then added to the system. Basically I would get a bucket of glycol from the drum outside and add it to the large plastic garbage can that we were using as a reservoir for the pump to add the glycol to the system, then added the proper amount of water to the glycol. A hose ran from the garbage can to the pump, and then from the pump to the boiler main. My main job while filling the system was simple. While Dale, the plumber, bled the system I ran the pump. With one hand on a valve, and the other on the plug for the pump, I kept an eye on a pressure gauge. The goal was to keep the pressure just a little under 30 psi, go over and a pressure relief valve will blow, spewing glycol, go 10 pounds or so under and there isn't enough pressure to get the fluid up to the attic and down to where it needs to go (the mile of pipes under the floor). You partially control the pressure with the valve, but if it starts to climb near 30 psi you shut the valve. When you shut the valve you have to unplug (or switch off) the pump, or you risk blowing out the hose from it's fitting. Just shut off the pump and not close the valve and the glycol mixture runs back into the reservoir. Things went pretty well, once we figured out that we were looking at the wrong numbers on the gauge, and after coffee when it came time to fill the reservoir again Dale took the opportunity to go home to make some phone calls. I filled the garbage can to a few inches from the top with a couple of buckets of glycol and the water to go with them, in all about, I don't know, 30 gallons. As Dale wasn't back at this point, I took the opportunity to go home and deal with a couple of small matters. I finished up and walked back to the house. When I got there I thought it was strange that Gary and the rest of the crew were not outside where they had been working earlier. As I walked up the back steps I noticed that there was glycol on the door sill, I hadn't remembered spilling any and made a mental note to be more careful with the next bucket. And then I opened the door. Sometime during my absence the garbage can had collapsed and fallen over, spilling its entire contents of glycol and water over the floor to the sealift room, water tank and mechanical room, soaking all the boxes of plumbing supplies stored on the floor. Everyone was madly cleaning it up, soaking it up, scooping it into buckets and containers. Now I have to find out how to dispose of it. Luckily, we still have enough glycol to finish the job. What a mess! But like I said the day finished on a high note. 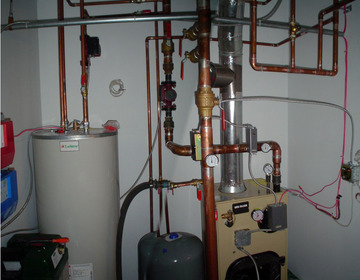 Once the clean up was done, we again set up the pump system, this time with the reservoir secured to a wall, and in quick order finished filling the heating loops (there remains the heat coils for the air exchangers, make up air and the hot water tank). And at long long last, we have heat. No more temporary measures, by tomorrow there will be a warm floor and warmer air in the house, and tonight there is smoke coming out of the chimney. Hard to believe, but Gerard leaves tomorrow for home. It's been good to have him here, and he's been fun to have around. Gerard is good natured, and takes my ribbing very well. He never seems down, even though he's faced some personal challenges while he's been here, including the death of his father and a friend. Shortly after he got here we learned that he had only tried perohgys twice before in his life, this particular meal being the third time. I'm mean come on, even babies raised by wolves have had perohgies more than that. He has steadily mudded and taped most of the house by himself. He is meticulous and proud of the job he does, working mostly alone while the rest of us works together. That is probably the hardest part of the entire job for him, for he loves to converse, about anything and everything. I'm especially happy that he managed a small trip out on the land last week, camping from Sunday to Thursday morning, hiking up to the top of one of the mountains on Adams Sound and enjoying the snowy vista. Now, this is probably one of those things that you have to be a part of to get. Actually that's not true because I don't get it and I'm a part of it. Gerard keeps telling one of the guys that they are going to go hunting Wooly Mammoths. 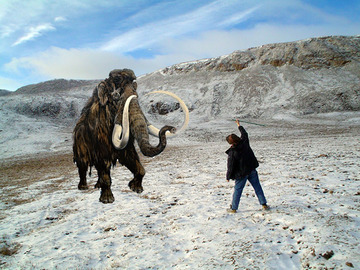 This of course is despite the fact that no self respecting Mammoth would be caught alive in this epoch or anywhere near Baffin Island, the last Wooly Mammoths disappearing on Wrangel Island about 4,000 years ago. Also because of the ice cover here the Baffin was out of their range. However, in honour of Gerard's stay here (that perohgy thing notwithstanding), and through the magic of Photoshop, here is the "proof" of Gerard's Mammoth adventure to the High Arctic. ....Thank you Bobby and Cissy, that was just great! Good morning Ladies and Gentlemen, and welcome back to hour thirteen of our Telethon of Hope. If you just joined us we are throwing this spectacular um, spectacle with the hope that we can get enough skilled crew to complete the Bed and Breakfast and send little Gary home. And lets check to pledge board. Okay, it still shows only 43 hours, but we still have a couple of hours left in the Telethon so lets RING THOSE PHONES. Ring those phones. Uh, did anyone check with NWTel? They promised we'd have service in five business days. Ring those phones. Wait here's a call now. This is great. We have a pledge from the Graduating class of First Year Carpentry. The three of them are pledging to come and they want to know if they can leave their tool belts and tools at home. This is great, let's keep those calls coming. Wait, ladies and gentleman, another one of our operators has a caller on the line. Jake is promising to be there everyday, and is willing to drag it out for as long as necessary. We're on a roll now folks, lets ring those phones. Another one, Gordon is pledging to come from Thursdays to Saturdays. Wait a minute, didn't we just get this pledge in hour six? Ali is on the line, he's willing to come in the afternoons, well most afternoons, well some. And here's another Arvin says he wants as many hours as he can get, as long as his partner doesn't get a job for half the pay and a third of the hours. Oh ladies and gentleman, Jackity just pledged a day and a half, and Jerry wants to know if he has to come to work today. Juna promises he'll come.. tomorrow... afternoon... but he'll be late. And a call from two plumbers who both say they'll get there sometime. Well it looks as though we've come to another lull in the action, lets check with the pledge board one more time. 55 hours! Let's not let this momentum slow down, ring those phones. Don't forget the phone number.. 1-800-SEND GARY HOME, that's 1-800-SEND GARY HOME. Now back to our entertainment before we return you to your regularly scheduled blog. Ladies and Gentlemen give it up for Topo Gigio. Today marks a year that Gary arrived in Nunavut, a year since he went to Kugluktuk to join us at the Fort Hearne for the Northwest Passage. I'm sure there have been many days that he regrets the day he answered the phone and heard me ask if he was interested in coming to the Arctic to build our B&B, oh and as a bonus, sail the Passage to get here. I'm hoping that most days though, he's happy he did. I knew Gary from my days in LaRonge Saskatchewan, and was lucky to have him in our circle of friends there. His easy going, thoughtful nature makes him one of those people who you warm to immediately. Gary had his own contracting company there, I had even asked him once if I could work for him in my spare time in order to learn carpentry. Spare time, however, wasn't something I had a lot of, working at one of Canada's busiest RCMP detachments so it didn't happen. Gary left for Japan a little before I was transferred out of La Ronge, and we lost touch after that. When we first started thinking about this project Gary was the first person that sprang to mind. We had decided to build ourselves and we needed someone with skills to be the Project Manager. Gary, I knew, had skills to spare. I didn't know where to find him, but suspected he was back from Japan. Luckily for me a couple of mutual friends, Pam and Russ, were able to track him down for me. He was in Vancouver, building high-end homes. When I first proposed his coming north for the project he was immediately interested, depending on the details. As it happened all of our ducks still weren't in order and we had to delay a year for the next sealift. When the next year rolled around Gary was still interested and we managed to work out the details we needed to get him up here, and we anticipated we'd be done in January or so. 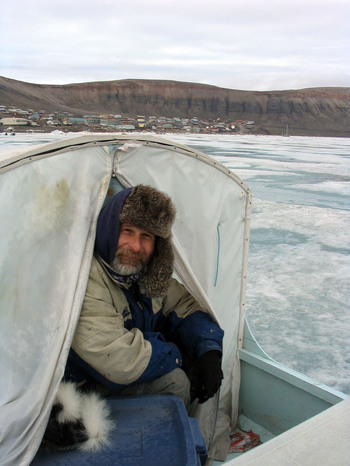 As an added bonus, Gary agreed to come up to Kugluktuk, work on the repairs of our ship, the Fort Hearne, and then sail with us through the Northwest Passage. I doubt Gary will ever believe another word I say. Mother Nature conspired against us, and the ice never opened on a critical section of the Passage. We never even put her in the water. And as for finishing in January... well... what can I say. I can't imagine anyone better suited for this project than Gary. He has an amazing eye for detail, and when we are finished the house will be better built than any other, I'd venture to say, in all of Nunavut. You'd be hard pressed to find anything out of plumb, or out of square anywhere in the building, and just when you think you'd nailed the last piece of wood into a wall, he'll find another reason to put one in. He's gone through a winter of building outside in -35, crew with almost no skills, no crew, my lack of skills and altogether too laid back nature, being away from Family and friends, and more. He's never taken more than three days off the whole year. He's stuck by us and the project when I'm sure most others would have left a long time ago. I can think of no one I'd rather have beside me, or teaching me carpentry. One year ago I couldn't even spell carpenter, now I are one. As much as I hate to see him go, I'd dearly love to give him his life back, and look forward to the time he can come back just for a visit, hopefully on the Fort Hearne next year. I'm not sure why but I've been wreaking havoc on tools of late. So I guess the latest crew stories should be about me. In order to protect the guilty I'm not going to use my own name in this post, only my initials - Clare Kines. The second tool I wrecked wasn't really my fault, at least I don't think so. I was affixing plywood strips to the kitchen floor yesterday in preparation for the in-floor heating. I was ready to shut down for the day and was trying to screw one last strip in place when the battery on Gary's new Hitachi cordless drill died. Not wanting to leave the job undone I went and got a new battery for it. I should point out that I had been using my cordless Black and Decker when it's battery died, rather than replace the battery I grabbed Gary's drill. Gary's drill began smoking. I mean smoking! I was actually scared to set it down in case it caught something on fire. This is the second expensive new drill of Gary's to bite the dust on the project, his Makita apparently beyond repair. Luckily my $129 Black and Decker is still going, perhaps there is a lesson there. I'm afraid I can't claim innocence on the first tool I did in this past week. Well actually it's not the tool, but its blade. Ali came to me on Friday and asked what the roof angle was as he wanted to cut a drywall sanding sponge to fit. I was at Gary's miter saw at the time, so I took the sponge and said I'd do it for him. I set the angle on the saw and merrily cut the block to the 28.45 degree angle. But I missed a bit of it with the angle, so I cut it a second time. Who'd of known cutting through a highly abrasive material would completely dull a blade. Well, its going to be difficult changing the name on this one. I've already put Gerard's name in the blog a few posts ago, and I know that both he and his wife read The House, so... I guess it'll just have to be out there for everyone to see. Gerard got to work here right away, taping and mudding the drywall. I'm going to assume that everyone knows that the gyprock on the walls doesn't come in one big sheet the size of your wall, and that all of the seams need to be covered up, for that smooth look. This involves putting a tape over the seams, and applying a "mud" in a thin layer over that, and any imperfections (such as nails and screws), and smoothing and sanding it until it looks like one seamless piece. The mud comes premixed with water, but it needs to be stirred up to use. We use a large paddle that goes on a drill. You stick the paddle in the mud, turn on the drill and voila. Now the paddle is stirring a very thick liquid, so the power of the drill is toned down significantly. Not so much with water. Gerard decided that the quickest, easiest way to clean the paddle was to stick it in a bucket of water and turn it on. The result was that water flew everywhere as it quickly rose up and over the sides of the bucket. Now that in itself would not be enough to make a crew story, after all it would seem like a logical thing to do... once. But yesterday, the memory of two days previous already fading, Gerard did it again. Only this time he used a little more water. Now he claims that he only held the paddle over the water, and that the paddle caught the side of the bucket, causing it to spin out of control, but the result was the same. I'm keeping him around to wash the floors, he does it faster than anyone I know. One of the first guys that we hired, Gordon, had a definite Mr. Magoo quality about him. He didn't start right away as he had been finishing up a job for another fellow here in town. But he made his presence known right from the start. We have drywall ladders that see double duty as saw horses. They are made of aluminum and are about 3 feet high, and three feet wide. Shortly after Gordon started he was cutting some lumber and was using the drywall ladders as support. Soon the awful sound of a saw cutting through metal could be heard all over the site. Heads were popping up everywhere to see what was happening. When it didn't stop, Gary began to search out the source. He found Gordon merrily cutting some plywood and incidentaly the ladder at the same time. Gary stopped him and he was quite surprised to learn that he hadn't been sawing just the wood. Couldn't he hear the aluminum being cut? "I'm a little deaf". Oh. When asked if he didn't notice how difficult it was to cut this particular piece of plywood, he didn't and after all, you can cut through wooden sawhorses, why not this one? It turns out that hearing wasn't the only sense that Gordon didn't have full capacity of. We soon learned that he couldn't see very well either. Gary was hanging a plumb bob to make sure one of the walls was plumb. He was on the top of the wall and Gordon was below, his job was to see if the bob was where it should be. After Gary dropped the bob, he waited a bit and then asked Gordon how it looked. Gordon asked how what looked? And Gary told him the bob that was hanging inches from his face? Sorry can't see it "I can't see very well". Then came the famous squint that we all became familiar with as he located the bob. The squint, you'd be working with Gordon and ask for a measurement or something, and he'd lean inches away from the tape, or the mark or whatever, squint his eyes and peer for several seconds before you'd get his answer. You'd be wise to ask for the measurement a second time, just to see if he interpreted the blur the sameway twice. Gordon was a good worker though but didn't really care for working outside at -35. When the opportunity came up for a job that was inside he took it. His specialty was drywall and painting, and now is when we could really use him. It would be good to hear those words of his now. "Can I hit it now? Now? How about now?"